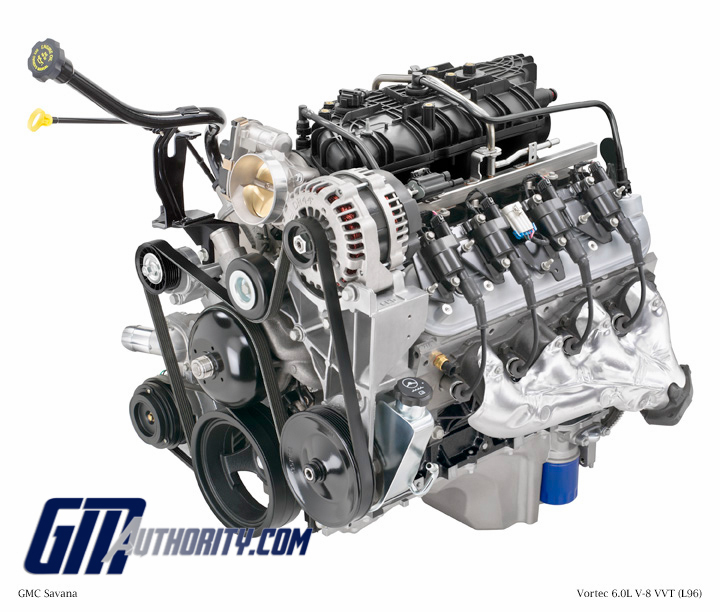 The 6.0L V8 Vortec L96 is an engine produced by General Motors for use in its full-size heavy duty (HD) pickup trucks, vans, and SUVs. Displacing 6.0 liters in a V8 configuration, the L96 is part of the Vortec (Generation IV Small Block) engine family, which was replaced by the EcoTec3 (Generation V Small Block) engine family. The L96 is the last Vortec engine currently in use by GM, with the EcoTec3 engine family replacing the Vortec line in all other GM vehicles. Notably, the L96 is the same engine as the LC8, but the LC8 is modified to run on Compressed Natural Gas as well as gasoline. The L96 is a heavy-duty workhorse engine. Variable valve timing helps the 6.0L (L96) optimize performance, efficiency and emissions. The 6.0L’s balance of performance and efficiency is great airflow throughout. Intake flow was improved over previous engines by straightening out and optimizing the flow path from the intake manifold into the cylinder heads, while the exhaust ports are also designed for greater flow. The engine’s efficiency also optimizes emissions performance. The 6.0L is powerful, but delivers exceptional refinement to go with great strength. Quiet features built into the engine are complemented by an improved engine cradle and mounting system. These help reduce vibrations transmitted through the chassis and into the passenger compartment. Cylinder Block and Rotating Assembly: the engine block was developed with math-based tools and data acquired in GM’s racing programs, and provides a light, rigid foundation for an impressively smooth engine. Its deep-skirt design helps maximize strength and minimize vibration. The bulkheads accommodate six-bolt, cross-bolted main-bearing caps that limit crank flex and stiffen the engine’s structure. A structural oil pan further stiffens the powertrain. Along with the rigid block, the engine’s rotating assembly was designed for optimal strength and duration complemented by features designed to make the L96 quiet and smooth. The L96 6.0L also features a heavy-duty timing chain developed expressly for quiet operation. The chain, which connects the camshaft and crankshaft, is validated for 200,000 miles of operation and fitted with a leaf-spring-type dampener. High-Flow Cylinder Heads and Valvetrain: the L96’s cylinder heads feature “cathedral”-shaped intake ports that promote exceptional airflow. They’re derived from the high-performance cylinder heads that were used on the “C5” Chevrolet Corvette Z06 and support great airflow at higher rpm for a broader horsepower band, along with strong, low-rpm torque. The intake ports that feed the combustion chambers, as well as the D-shaped exhaust ports, are designed for excellent high-rpm airflow. Camshaft Phasing: the L96 features variable valve timing, maximizing engine performance for given demands and conditions. At idle, for example, the cam is at the full advanced position, allowing exceptionally smooth idling. Under other conditions, the phaser adjusts to deliver optimal valve timing for performance, drivability and fuel economy. At high rpm’s it may retard timing to maximize airflow through the engine and increase horsepower. At low rpm’s it can advance timing to increase torque. Under light loads, it can retard timing at all engine speeds to improve fuel economy. E85 Flex-Fuel Capability: E85 is a clean-burning, domestically produced fuel composed of 85 percent ethanol alcohol and 15 percent gasoline. Ethanol is renewable and produces fewer emissions in the combustion process. It can be produced from various feed stocks, including corn and wheat stalks, forestry and agricultural waste and even municipal waste. Advanced Electronic Throttle Control: with ETC, there is no mechanical link between the accelerator pedal and the throttle body. A sensor at the pedal measures pedal angle and sends a signal to the engine control module (ECM), which in turn directs an electric motor to open the throttle at the appropriate rate and angle. The ETC system can deliver outstanding throttle response and greater reliability than a mechanical connection. Quiet Exhaust Manifolds: the exhaust manifolds were developed to improve durability and sealing and reduce operational noise. Cast nodular iron was the material of choice for its basic durability and excellent heat-management properties. The manifolds are fitted with new triple-layer heat shields fabricated from stainless steel and insulating material. The shields limit heat transfer from the engine to the engine bay, allowing the 6.0L to reach optimal operating temperature more quickly, yet reducing heat in the engine compartment once that temperature is achieved. 58X Ignition System: the L96 has an advanced 58X crankshaft position encoder to ensure that ignition timing is accurate throughout its operating range. The new 58X crankshaft ring and sensor provide more immediate, accurate information on the crankshaft’s position during rotation. This allows the engine control module to adjust ignition timing with greater precision, which optimizes performance and economy. Engine starting is also more consistent in all operating conditions.